"Kinko" and "Kinko's" redirect here. For the former operations in Japan and South Korea, see Konica Minolta. For the town in Japan, see Kinkō, Kagoshima. FedEx Office Print & Ship Services Inc. (doing business as FedEx Office; formerly FedEx Kinko's, and earlier simply Kinko's) is an American retail chain that provides an outlet for FedEx Express and FedEx Ground (including Home Delivery) shipping, as well as printing, copying, and binding services. Unlike its main competitor, The UPS Store which is franchised, all FedEx Office stores are corporate-owned. Paul Orfalea, whose nickname was "Kinko" because of his curly hair, founded the company as Kinko's in 1970. Its first copy shop, which Orfalea opened with a sidewalk copy machine, was in the college community of Isla Vista next to the campus of the University of California, Santa Barbara. He left the company in 2000, following a dispute with the investment firm Clayton, Dubilier & Rice ("CDR"), to which he had sold a large stake in the company three years earlier. Orfalea wrote in his autobiography that disentangling him from Kinko's took enormous effort from the lawyers at Gibson, Dunn & Crutcher. The problem was that rather than adopt the traditional franchising model (by which the promoter creates a corporation that sells franchises), he had built the company as a series of loosely connected personal partnerships between each store owner and himself. By 1997, he had established over 127 Kinko's partnerships. All had to be carefully dismantled and rolled into a single S corporation to convert the company to a more centralized corporate-owned business model. Orfalea and several other key partners believed doing so would decrease time Orfalea spent mediating disputes between different factions of Kinko's partnerships and enable the oldest partners to cash out smoothly and transition to a new generation of managers. However, the new structure also made it easier for CDR to gradually force him out of his own company. Kinko's corporate headquarters was in Ventura, California for many years, but in 2002, the company relocated to Galleria Tower in Dallas, Texas. In February 2004, FedEx bought Kinko's for $2.4 billion, which then became known as FedEx Kinko's Office and Print Centers. Prior to the FedEx acquisition, most Kinko's stores were open 24 hours a day. After the acquisition, FedEx reduced the hours for many locations. On June 2, 2008, FedEx announced that they were re-branding FedEx Kinko's as FedEx Office, the retail branch of the FedEx Corporation. 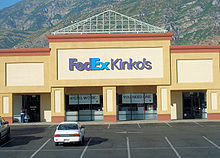 As of early 2010, some stores and branding still showed FedEx Kinko's signage. To ease customer confusion during the transition period, many stores displayed a large purple sign in the window that said "Kinko's Printing Inside." Brian Phillips is the President and Chief Executive Officer, following Ken May's departure on March 7, 2008. The company's primary clientele are small business and home office clients. According to the company, it has approximately 1,900 operating facilities. With over $2 billion in revenues, the company is the 7th largest printing company in North America. The company's primary competitors in the crowded North American market include The UPS Store, Office Depot, OfficeMax, AlphaGraphics, Staples, Sir Speedy, and Vistaprint. Kinko's pursued an international expansion strategy during the boom years of the 1990s and early 2000s. Countries hosting FedEx Office centers outside the U.S. include Kuwait, Lebanon, and the United Arab Emirates. Kinko's formerly operated in Australia, Mexico, and the Netherlands but withdrew from those markets in late 2008 due to low demand. During the 2008–2012 global recession, FedEx Office subsequently withdrew from China, Japan, South Korea and the United Kingdom. Konica Minolta bought the Japanese and South Korean operations from FedEx. On July 24, 2017, Fedex announced that its 24 Canadian stores, a manufacturing plant in Markham, Ontario, and its head office in Toronto, will be closing on August 18, 2017 after 32 years of operation with 214 employees being laid off. FedEx's Canadian shipping operations will continue, however. In March 2018, FedEx Office announced that it would open 500 stores inside of Wal-Mart locations throughout the U.S. Besides traditional full-service copy and print shop services, all stores also provide a number of self-service features: color and monochrome photocopiers, fax machines, laminating machines, digital photo printer kiosks, and several desktop computer rentals, of which one always has an image scanner and some design software (mainly Adobe Systems applications) installed. The computers available for rental are connected to at least one color and one monochrome laser printer. Some newer stores have only a color printer but charge less for monochrome prints. Most locations also have at least one or two empty seating areas for patrons to use their own laptop computers, using complimentary WiFi connections provided by AT&T. The stores also offer a selection of office supplies and business books for retail purchase. ^ RiShawn Biddle (January 13, 2003). "Kinko's Cuts Ties To Founder". Forbes. ^ Paul Orfalea and Ann Marsh, Copy This! : How I Turned Dyslexia, ADHD, and 100 Square Feet Into a Company Called Kinko's (New York: Workman Publishing, 2007), 171-176. ^ Becker, Nathan (June 2, 2008). "FedEx takes charge to drop Kinko's name". MarketWatch. Retrieved August 16, 2015. ^ "FedEx-Kinko's To Drop Kinko's Name". 11alive.com. ^ "FedEx Office". December 15, 2011. FedEx.com. Retrieved February 27, 2012. ^ "GAOnline 101 Top North American Printers". Graphic Arts Monthly. Wikimedia Commons has media related to FedEx Office. This page was last edited on 30 March 2019, at 16:52 (UTC).